Today I finished reading Still Life by A. S. Byatt. I didn’t like this book nearly as much as Possession, but it still was fairly interesting and engaging. I particularly liked this book because one character is fascinated with Van Gogh and several excerpts from Van Gogh’s writings are quoted and discussed. I also could relate quite a bit to one character, Stephanie. At the beginning of the book, Stephanie was the mother of a new baby that would spend her time dreaming up hypothetical Ph.D. dissertation topics. Yeah, I can relate to that. According to Raphael, anonymity is a factor which determines great art. This is such a modernist way of thinking! 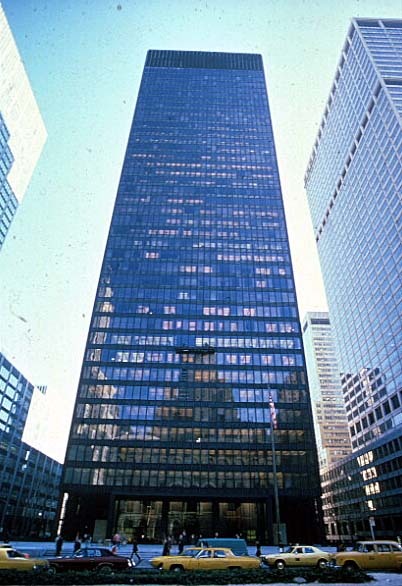 Modernist sculpture (think of the Minimalists) and architecture (like the Seagram Building) refuse to recognize the sculptor or architect which masterminded their creation. They also exude “clarity” and “selflessness” in their sleek, industrialized design. As a postmodern reader and art historian, I think this rejection of personal style is rather silly and extreme (although, granted, I do like the modernist aesthetic). Obviously, though, I feel this way because I have been trained and educated to celebrate individual thought and contribution. Today, most art history survey courses are constructed to follow the career of one great artist after another. These artists become recognizable by their distinct stylistic characteristics and “personal styles” which can then be recognized as influences on lesser (dare I say anonymous?) artists. I love Van Gogh’s style. He has a great use of color which makes his paintings very striking. My favorite thing about Van Gogh, however, is his use of impasto. His paintings are so tactile and tangible – I adore it! One has to see a Van Gogh in person in order to appreciate the sculpturesque quality of some of his paintings. 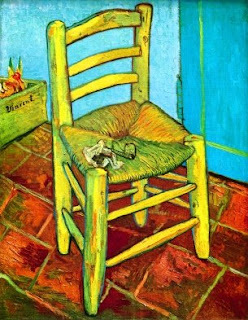 In this reproduction of The Yellow Chair (1888) some of the paint buildup can be seen on the brick tiles, but it really isn’t the same. In Byatt’s book, a playwright is obsessed with this painting and writes a play about Van Gogh and The Yellow Chair. The play stage is set up with a lot of different colors which reference Van Gogh’s brightly painted canvases (and also some of his darker paintings, like The Potato Eaters). It was so fun to read about the play; I wish that it really was on the stage! Even though there really isn’t such a play, I do know of a good substitute. There is a brightly colored Van Gogh segment in Kurosawa’s film Dreams which can be seen here and here. Watch it. The cinematography is lovely. 1 There is some interesting literary analysis of Still Life found here. 2 A. S. Byatt, Still Life, (New York: Collier Books, 1985), 338.